One of my favourite thinkers, Rumi – a poet from XIII century – said: Don’t grieve. Anything you lose comes round in another form. 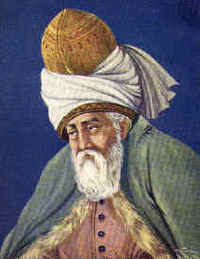 I would like to complete Rumi’s words by a notion of love in grief related to relationships. Grief and loss are inseparable aspects of Life…there is nothing permanent in Life – yet the Movement of Life goes permanently ahead with bringing future and losing past. This masculine energy originated mindful wisdom wouldn’t be completed without their feminine energy component: accepting pain of grief as an aspect of love. It would be no pain and no grief if it would be not a great love behind; that’s a heart wisdom. Until some time ago I was habitually perceiving grief and loss as unavoidable and negative aspects of Life. Then I’ve realised – because of everything is impermanent – we can grow! Flowers will blossom. Fruits will ripe. Our babies can learn and grow and become adults. We can change in order to be better people. Bad times are temporary also. What appeared black – might change the colour. Learning to let go and to grieve is like learning allowing yourself to flow effortlessly along with the River of Life; not resisting the flow of Life and opening up to whatever comes. How to open up and to not resist pain of grief? Heart feminine wisdom guides us to see diamonds of love in pain; that deep compassionate perception of grief reveals how deep is Love, and how eternal is Love. In constellation process we see that separateness is an illusion. At the deep level of bonds in relationships we are never separated from others; therefore the experience of loss is only related to some aspects of connection; in other aspects of our relationships we never lose what is once bonded. Recently I was participating in a constellation where I was representing a grandmother; it was a complex family situation with a lot of heavy entanglements, and constellation’s phenomena were unfolding very slowly and mysteriously. Representing the grandmother of the client – I was experiencing first strong resistance to my trauma (as a representative) but in the process of constellation it become clear that my avoidance has affected heavily the system in three generations, and pain was not subsidized but increased, like an echo in an acoustic space. In my experience as the grandmother I slowly let myself to open up to horror of my trauma (literally I felt letting the pain sinking in me, no longer pushing it away). There was also a grief over what had happened, allowed to be present fully now. Opening up to pain was scary but then liberating, and the family system was relieved in result. Going through these stages I could experience miraculous movements of life and love, letting go of resistance to pain, and allowing to grieve. In order to let love flow. Going on a journey with a shadow companion – Grief – is perhaps the most challenging growth process. Yet – it brings amazing rewards: a love, free to flow and embrace everything.